What's in it for the novice? All these questions are very natural and our guides have had years of experience in helping new riders feel relaxed and learn about horseback riding at a comfortable pace. One of the things we do is specialize in helping our guests build their riding confidence, communicate with the horse and take things one step at a time. This confidence is what will give you a great ride where you truly enjoy the experience. In fact, we would bet that by the end of the ride you'll be doing things you never dreamed you would have at the start! well maintained and highly trained, no fear here! There are several things that allow us to accomplish this and it’s what helps make Windwalker unique. First, we take people out in small exclusive groups so that we can give those who require it the personalized coaching during their ride, teaching them the skills they need to be a better rider. Second, because of our small guide to rider ratio and a wide variety of horses to choose from, we are able to select the right horse and pace that matches any experience level. Lastly, we have over 15 years of experience working with novice riders, so we know when to stay right there with you or let you go off on your own both of which can create a very memorable experience. 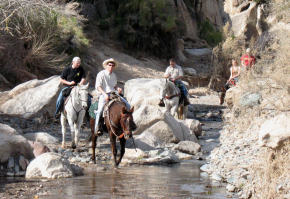 All of Windwalker’s guides are very experienced horsemen with an extensive background in riding instruction and catering to the needs of guests who have a taste for the raw outdoor experience that Arizona has to offer. With a vast selection of trail systems to choose from our guides will determine the best wilderness trail for you and your party based on your experience level. They will use their knowledge of Sonoran Desert terrain, history, weather and the unique Arizona wilderness, and thus help to craft a special experience that you will be sure to remember. All of our guides own and train their horses, which means that they know the horse you will be riding quite well. All of these factors combine to make a huge difference in the quality of experience you are going to have compared to the traditional alternatives. So, being a bit nervous before going out on a horse is perfectly natural, and something we have helped people deal with for many years. If we weren’t so good at it, we simply would not have the very high rate of return riders, 100+ guestbook entries and referrals that we do!